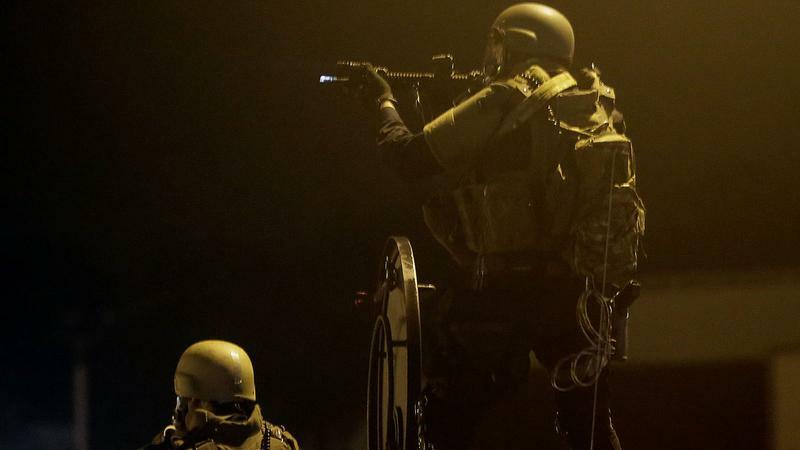 An officer aims his rifle during a protest in Ferguson, Mo. 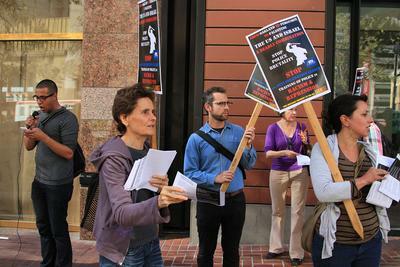 The protests have reignited concerns about the militarization of U.S. law enforcement. But there has been another, little-discussed change in the training of American police since the 9/11 attacks: At least 300 high-ranking sheriffs and police from agencies large and small – from New York and Maine to Orange County and Oakland, California – have traveled to Israel for privately funded seminars in what is described as counterterrorism techniques. For some, dispatching American police to train in a foreign country battered by decades of war, terror attacks and strife highlights how dramatically U.S. law enforcement has changed in the 13 years since al-Qaida airplane hijackers crashed into New York’s World Trade Center. In many places, the image of the friendly cop on the beat has been replaced by intimidating, fully armed military-style troops. And Israel has played part in that transition. As these trips to Israel became more commonplace, the militarization of U.S. law enforcement also was driven by the creation of various homeland security initiatives and billions of dollars of surplus military-grade equipment donated to local departments through the 1033 program after 9/11. Shakeel Syed, executive director of the Islamic Shura Council of Southern California, described the tactics he sees American police use today as “a near replica” of their Israeli counterparts. The law enforcement seminars in some ways resemble other privately funded trips to Israel, such as the birthright trips for Jewish young adults and programs for politicians, educators and other professionals. Stops on the law enforcement tours include not just the Western Wall, but also West Bank border checkpoints, military facilities and surveillance installations. Participants speak highly of the experience. Former U.S. Capitol Police Chief Terrance W. Gainer called Israel “the Harvard of antiterrorism” after taking part in a 2005 trip sponsored by the Jewish Institute for National Security Affairs. Capt. Brad Virgoe of the Orange County Sheriff's Department in California called the 2013 session he took part in an “amazing experience,” recalling visits to checkpoints in Eilat at the Israeli-Egyptian border and in the West Bank near Bethlehem. Since 2002, the Anti-Defamation League, the American Jewish Committee’s Project Interchange and the Jewish Institute for National Security Affairs have sent police chiefs, assistant chiefs and captains on fully paid trips to Israel and the Palestinian territories to observe the operations of the Israeli national police, the Israel Defense Forces, the Israeli Border Patrol and the country’s intelligence services. Tax documents from the Jewish Institute show the organization spent $36,857 on the trips in 2012. The U.S. program began less than a year after 9/11, when the Jewish Institute brought nine American police officials to Israel to meet with Uzi Landau, Israel’s public security minister at the time. Participants represented the New York and Los Angeles police departments, the Major County Sheriffs' Association, the New York and New Jersey Port Authority police and the New York Metropolitan Transportation Authority police. Recently, the seminars drew attention during the Ferguson protests because the former chief of the St. Louis County Police Department, who retired in January, had participated in a 2011 trip to Israel sponsored by the Anti-Defamation League. Israeli security forces’ history of training police in counterinsurgency tactics predated that trip. In Mexico’s Chiapas state, Israeli military officials have been training police and military to combat the Zapatista uprising since 1994. The most recent Israeli training mission to Chiapas took place in May 2013. Topics covered have included preventing and responding to terrorist attacks and suicide bombings, the evolution of terrorist operations and tactics, security for transit infrastructure, intelligence sharing, and balancing crime fighting and antiterrorism efforts. The training also touches on ways to use Israel’s counterinsurgency tactics to control crowds during protests and riots. Virgoe told CIR that he and his Israeli counterparts frequently discussed protests and crowd control methods. Virgoe also recounted the Israeli national police’s efficiency in dealing with hundreds of thousands of Sephardic Jews who poured into Jerusalem for the funeral of Rabbi Ovadia Yosef in October. The head of the Maine State Police, Col. Robert Williams, joined a trip sponsored by the Anti-Defamation League in early 2013. Speaking to the Bangor Daily News after his return, he noted that his Israeli counterparts had decades of experience in dealing with protests and he was impressed with their ability to suppress demonstrations. “They call it riots and we call it civil unrest,” Williams told the newspaper. San Diego Assistant Police Chief Walt Vasquez was on the same October 2013 trip as Virgoe and described a week of travel and training with the national police, Israel Defense Forces and intelligence officials. Vasquez also recalled “lots of discussions about crowd control” tactics. He was intrigued by a demonstration of the extensive surveillance camera network that covers Jerusalem. Crowd control training provided by Israeli authorities to American law enforcement officials disturbs Human Rights Watch researcher Bill Van Esveld, who studies Israel and Palestine. In Israel, “in a majority of cases, you’re seeing demonstrations that start with rock-throwing and devolve into tear gas, rubber bullets and sometimes live rounds being fired at people who are throwing stones,” he said. Van Esveld added that his research has shown the risks for law enforcement are not as high in Israel, where he said officers and soldiers frequently disobey orders governing lethal force against demonstrators and rarely face discipline or other consequences. “It is very rare that you get a soldier or policeman thrown in jail for killing or injuring someone – in practice, there’s a lot of looking the other way,” he said. Israel’s use of less-lethal munitions in crowd control received international attention in 2009, when American activist Tristan Anderson was struck in the face with a high-velocity tear gas canister during a West Bank demonstration against Israel’s border wall. His skull was shattered, leaving him in a coma for months. Now, he uses a wheelchair. Rashid Khalidi, the Edward Said professor of modern Arab studies at Columbia University, said the seminars reflect a militarized mindset diametrically opposed to traditional police-community relations in the United States. “If American police and sheriffs consider they’re in occupation of neighborhoods like Ferguson and East Harlem, this training is extremely appropriate – they’re learning how to suppress a people, deny their rights and use force to hold down a subject population,” said Khalidi, a longtime critic of the Israeli occupation. He pointed out a fundamental difference between the American and Israeli justice systems: Jewish residents fall under Israeli criminal law, but Palestinians are subject to Israel’s military justice system. Khalidi said Americans are learning paramilitary and counterinsurgency tactics from the Israeli military, border patrol and intelligence services, which enforce military law. The most tangible evidence that the training is having an impact on American policing is that both countries are using identical equipment against demonstrators, according to a 2013 report by the Israeli human rights organization B'Tselem and photographs of such equipment taken at demonstrations in Ferguson and Oakland and Anaheim, California. Tear gas grenades, “triple chaser” gas canisters and stun grenades made by the American companies Combined Systems Inc. and Defense Technology Corp. were used in all three U.S. incidents, as well as by Israeli security forces and military units. Footage shot by activist Jacob Crawford in Ferguson last month revealed law enforcement used a long-range acoustic device that sends out high-pitched, painful noises designed to scatter crowds. Israeli forces first used such devices in response to West Bank protests in 2005, according to the B'Tselem report. David Friedman, the Washington, D.C., regional director of the Anti-Defamation League, organized the dozen Israel seminars hosted by his organization for law enforcement leaders. For logistical reasons, he said, participation has been limited to “the highest levels of law enforcement.” However, Friedman confirmed that the University of Wisconsin’s police department participated, and news coverage as well as news releases from his organization show other smaller agencies and campus police began participating in the mid-2000s. Last year, the league brought American law enforcement to meet with Palestinian police in Bethlehem for the first time. Friedman emphasized that counterterrorism is the focus of the seminar, though he acknowledged that crowd control does figure into the training, with Israeli officials showing footage and presentations from protests and demonstrating the equipment they use. The Jewish Institute for National Security Affairs and the American Jewish Committee did not respond to interview requests about the law enforcement training seminars they sponsor.